If you would like to be added to our mailing list to ensure that you are notified of upcoming shows and events at Ocean Galleries, please contact us via e-mail using our contact form. Alexandra Nechita first exploded onto the art scene at the age of nine. Her special talent was instantly recognized as capacity crowds came to see her often monumental paintings full of symbolism, emotion aand messages of peace. Art critics began telling the world about this rarest of child prodigies – a master of drawing and color – an artist who has a visual language all her own. Now in her twenties, a third year art major at UCLA, with world museum exhibitions to her credit, she continues to mature into a masterful artist of the 21st century. World class curators and critics agree she is a technical virtuoso with extraordinary vision, energy and talent whose evolution is sure to become a benchmark in the history of art. Howard Behrens and Candice Behrens at Ocean Galleries, Stone Harbor and Avalon, New Jersey Ocean Galleries presented Howard Behrens, renowned palette knife painter and his daughter Candice Behrens in her debut appearance and their first combined show at Ocean Galleries on August 4th -6th. Candice, a 2005 graduate of the College of Fine Arts at Boston University, uses both a brush and a palette knife to depict images of the human body. Her inspirations are her father and neo-classical style Italian Baroque painter Caravaggio. Howard Behrens is known as the undisputed leader of American palette knife artists. He draws his inspiration for his land and seascapes from traveling coastal regions. Peter Max at Ocean Galleries, Stone Harbor and Avalon, New Jersey Legendary artist and pop- icon Peter Max has always promoted a “love all, serve all” culture, and this summer his creative efforts in the beach community of Stone Harbor, NJ will help aid shore towns across the globe. 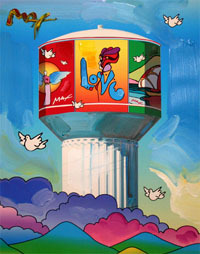 In celebration of “The Creative World of Peter Max” exhibition at Ocean Galleries (Stone Harbor) over the July 4th holiday weekend, Peter Max has created an incredible oversized mural that covered the town’s massive water tower structure. The vibrant artwork was digitalized and imprinted onto a 29’ by 156’ vinyl that covered the water tower structure, which soars nearly 150 feet into the Jersey Shore skyline. The vivid artwork is distinctively Peter Max, displaying a combination of his well-known images, such as Love and Profile, with a modified flair, as well as colorful imagery reflective of nature. The project will help raise funds for Stone Harbor’s Wetlands Institute, a non-profit organization that promotes the conservation and preservation of coastal ecosystems, as well as relief efforts for other coastal towns that were victim to the devastating effects of the 2004 Tsunami and last year’s hurricane Katrina. The complex project of printing and mounting the vinyl was underwritten by numerous community businesses including Sturdy Savings, Diller & Fisher Realtors, and Seashore Ace Hardware Home Supply, as well as contributions from Island Pursuit, Fred’s Tavern and Liquor Store, Hoys Five & Ten, Cosenza Construction, and Ocean Galleries. Peter Max is matching the donations of the generous sponsors in artwork that will be given to the Wetlands Institute for future fund raising efforts. 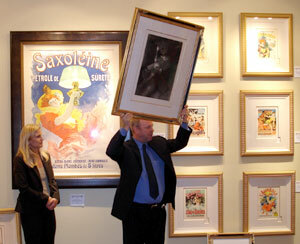 Toulouse Lautrec at Ocean Galleries, Stone Harbor and Avalon, New Jersey “Toulouse-Lautrec and the Art of the Belle Epoque” opened Friday, May 26 and ran through Memorial Day weekend at Ocean Galleries. On display was original etchings, lithographs, pastels and oil paintings by Henri de Toulouse-Lautrec and others of the era, including Alphonse Mucha and Jules Cheret. Receptions were held from 7 to 10 p.m. each evening, as well as a daytime reception from on Sunday. Each reception began with a lecture on the value and significance of the artwork.